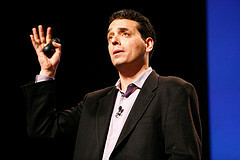 Learn from author Daniel Pink giving some nuggets from his newest book “To Sell Is Human” in the great podcast from Harvard Business Review! Personal, pervasive, permanent: How we often make these mistakes of negative generalizations in our self-talk, and a tip of self-talk that actually works. Introverts vs extroverts as salespeople: Surprising facts on what’s the personality type that most often gets hired/promoted in sales jobs – vs what’s the type that really performs the best! Utility vs curiosity in email subject lines: How we can strive for one or the other for effective communication… instead of ending up somewhere in the muddy marshes in between the two. … and that’s a bit of what I learned today! Please share – what did you learn today? How did you sharpen your entrepreneurial saw? And in what kinds of situations are you the salesperson and the customer, respectively? Previous Post Previous post: The Passion Of Ideas. The Entrepreneurial Disease.